Dr. Bazzi attended medical school at Barry University School of Podiatric Medicine in Miami, FL. After graduating in 2010, he completed his residency at Southeast Michigan Surgical Hospital in Warren, MI. 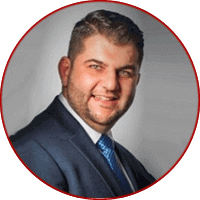 Dr. Bazzi is qualified by the American Board of Podiatric Medicine and Surgery and is board certified by the American Board of Foot & Ankle Surgery. He has affiliations with Detroit Medical Center, St. John Providence, and Michigan Surgical Hospital. Dr. Bazzi specializes in diabetic wound care and amputation prevention. He has been in practice since 2013. Dr. El-Khatib attended medical school at Temple University School of Podiatric Medicine in Philadelphia. After graduating in 2012, he completed his residency at Michigan Surgical Hospital in Warren, MI. Dr. El-Khatib is board certified by the American Board of Podiatric Medicine and has hospital affiliations with Southeast Michigan Surgical Hospital, DMC Sinai-Grace Hospital, and St. John Hospital & Medical Center. Dr. El-Khatib specializes in general podiatric medicine and foot and ankle orthopedic surgery. He has been in practice since 2015. Dr. Doan received her Doctorate in Podiatric Medicine in 2015. She has a hospital affiliation with Southeast Michigan Surgical Hospital and specializes in general podiatric medicine. She has been in practice since 2018.